Christmas is over and presents have been delivered worldwide, but Valentine’s Day is just around the corner. Have you ever thought of sending your Valentine a surprise gift, but worried they won’t be home to accept it? Have you ordered that special someone the perfect online gift, but know you won’t be at home when it arrives? Well, no more having to miss your unsigned deliveries – our secure range of parcel boxes is the perfect solution for all your mail concerns. Waiting at home all day for a parcel, which you know will be too big to fit through your letter plate is no fun. 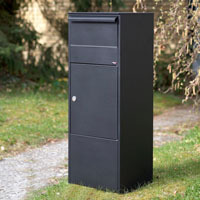 We supply an extra large capacity parcel box, ideal for residential and commercial properties. Or perhaps you’d prefer our parcel dropbox, which makes it easy to post mail, close and know it’s dropped into a secure lower box. Only accessible with a key, the amazing value parcel dropbox includes features such as antitheft and soft close devices. We regularly evaluate design preferences our customers need, with security kept in mind. So say ‘no’ to a trip to the sorting office this Valentine’s and install your own parcel box today. For more information on the range on parcel boxes we have to offer, please contact us today.